Forming part of our film envelope range, these mailing and mail-order envelopes are aesthetically pleasing as much as they are protective of their contents. Can be personalised with corporate logos and offered with seal and reseal or permanent adhesives. Sequential numbering can be incorporated with redemption film tear-off sheets. Perforations can be added for security. 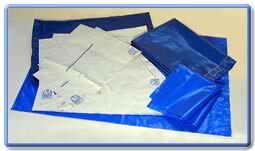 Transparent film EASYWRITE envelopes for mail-shots, or opaque, quality security envelopes for mailing or mail-order, all of these minimising postage weight within a constraint of toughness. Contact us now for a free sample pack. Seeing is believing. Try them out for yourselves!